Superman, cut and muddied from a battle, flies toward a threat he wishes to tell the world about, but won't have time to. He's being followed by cameras. Thinking back, he recalls fighting tentacles with Zatanna as Arion looks on and goads, telling Superman that he's causing the tide of darkness. Zatanna has Superman use iron to ground the creatures. Phantom Stranger appears, and informs Superman that he hasn't found Arion, and that dark energies have indeed been building. Arion's attacks continue for eleven days, catastrophe the world over. Lana Lang has the Lexcorp technicians unleash "Scramcams," the cameras that were following Superman at the beginning of the issue, after Superman in an attempt to capitalize on a failing experiment as Lexcorp collapses, with WLEX sold off. Over Machu Picchu, Superman ruminates. Subjekt-17 calls to him, and asks him to either beat the information of where Arion is out of him, or side with him against humanity for their cruelty. 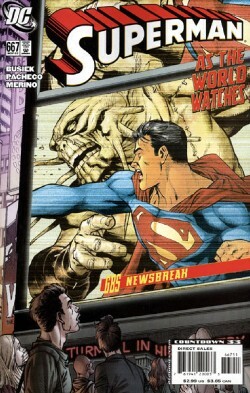 He tries to goad Superman by attacking him, and Superman attacks back, punching Subjekt-17. Superman tries to get away, but Subjekt-17 doesn't relent. He begins hitting Subjekt-17, then hits him excessively, essentially beating him down. Subjekt-17 accedes, telling Superman where Arion is, having goaded Superman into a moral failure. Subjekt-17 indicates that he will return. Superman offers to take him to medical care, but Subjekt-17 refuses, and dies of the internal injuries that Superman has caused. The cameras record this. Superman finds Arion's lair. He can't break in with his powers, so he makes a whirlpool and crashes the ocean onto the safehouse, bashing it in. Story - 1: I expected to rate a lot higher on this one, given that it's the penultimate chapter, so I read, and that there were a lot of elements to potentially be drawn together and made pretty. Instead, we have a story with a good deal of wasted space, an absolutely abhorrent character moment for Superman, and a lot of uninspired repetition. The first two pages assert a dilemma and then make us go back in time. A typical story device, but usually the reason for using such a device is to make us blanche at the absolute horror of the situation only to return us to normalcy. Here, Superman has minor cuts and cameras following him. Uh, okay. Two wasted pages with introspective meandering. Beyond that, Superman asserts that he wishes the world could know why he was doing what he was doing, but they never will. And he's being followed by cameras recording his every move. I forgot the part where he went mute. You can argue he was underwater, but not when he was leaving 17. A guest appearance with Zatanna where they fight meaningless tentacles to reassert that which we already know: approaching darkness, Superman potentially at fault, Arion goading, etc. Yeah. We get it. It's only been over a year of this, guys. "Zatanna, what ARE these things?! I tear them to pieces, but they just grow back -- !" "I don't know, Superman -�But they're resisting even MY magic! I can only affect them in SMALL WAYS -- -- as if whatever's EMPOWERING them is drawing on UNIMAGINABLE ENERGIES!" Very Silver Age, very childish, and it tears you right out of any realism the story might have. I felt, on that page, like I was reading Countdown, which is a grievous insult indeed. The Phantom Stranger's appearance is gratuitous, serving no purpose Zatanna could not have given the undefined objective nature of magic, and further convoluted by the fact that Phantom Stranger, along with several other near deified DC sorcerers, is high above the league of Arion, and could easily find him by my reckoning. Arion has a few centuries of experience? Isn't Phantom Stranger an eternal? I know at very least that his turn as a rodent was to show just how enormous Spectre's powers are, so he's not chopped liver. If Superman can get through Arion's defenses with kinetic energy, Phantom Stranger is more powerful, as he can defeat time, matter, and space. Phantom Stranger cool factor is not as great as the breach of story. More of Lana as CEO without any rationale for Lana as CEO. The reason: Cameras on Supes. More on that in a moment. I still don't buy Lana as a CEO, and it seemed very out of place in this episode. Did it need a whole page? Among the other wasted space, you be the judge. Superman spends a page in introspection over Machu Picchu, establishing what has already been established. Arion is a bad guy and needs to be spanked, and Superman is conflicted about that. GOT THAT. I mean, seriously. We've got it now. We don't need it reiterated again. Resolve. Then, well, then the roof caves in and the issue drops straight to hell. Subjekt-17 appears (groan). He is now coherent, and demands that Superman choose people or aliens. Superman makes the obvious choice, and even indicates that he knows that Subjekt-17 offers this Sofie's choice in order to goad him into a fight. In other words, he knows that Subjekt-17 is simply a confused, hurt being who wants to fight because it's all he knows. With me? Superman responds to the goading, when 17 begins an attack, by flying backwards, trying to continue to rationalize with the cogent creature, and then gets the location of Arion from him by appealing to his sense of utilitarian hope despite his alien nature. No, wait. I got that last part wrong. Actually, he escalates the fight and then beats Subjekt-17 to death on camera. It seems this is supposed to be condoned, given that big action and a splash is given to Superman's decision to escalate, slamming a fist into 17's stomach, and then giving us an entire page and give panels of Superman pummeling 17 to death while screaming in a furor. Realizing what a horrible thing he's done, Superman grabs the protesting Subjekt-17 and takes him to medical care, only to collapse in remorse as Subjekt-17 dies as a result of his own moral failure. No, wait. I got that last part wrong. Actually, he just lets Subjekt-17 die. And hey, he does all this on camera, so lord knows, we don't need any gravitas associated with the fact that a superhero just killed a villain on camera. I mean, that wouldn't lead to any kind of crisis that is infinite in recent history, would it? I speak in sarcasm, because of course this kind of thing should not pass without at very least a long beat. Not in an issue where we have half a page devoted to jokes between one Arion and another. Not in an issue where two pages go to water falling on a castle under the sea. Truth be told, this isn't the issue where Busiek lost me. I gave him a fair shake, and wanted to enjoy this run. He lost me a few issues back, when things got rambling and incoherent with Jimmy, and when he was doing every single book in the Superman world seemingly with very few shining forth, at all. Here, he moves on to scorn. You had my favorite character, Superman, beat a character to death, and the ends justify his means. Art - 5: Great art, despite what's depicted. The story choices are, to me, poor, but that doesn't make the depiction of the water falling on the castle less compelling, or the fight with Subjekt-17 poorly drawn. It's all exquisitely rendered. I just wish the story was one that I could stand by. Zatanna is a bit odd, but not by much. The only thing that pulls the art down is a bit of an overactive letterer, who is taking the speech and bubbles and going crazy with them, overshadowing a lot of the art. I don't know if this is script specified, or just a letterer going nuts, but it's very Silver Age in what is essentially a quite serious story, and it throws the rest off. Cover Art - 5: Even crummy words on the cover can't throw off the power of this image. They thankfully blend into the background as the pose, the perspective, and the coloring all conspire to make one of the better covers I've seen in a while, which is odd, coming off the stream of relative crap covers that have plagued the super-titles lately.